Blooming Hawthorn crowns the top of the railings, beneath the hawthorn, are three wreaths of mixed seasonal foliage and flowers mainly rosemary, gorse and forget-me-not on each side with another just above the small opening. 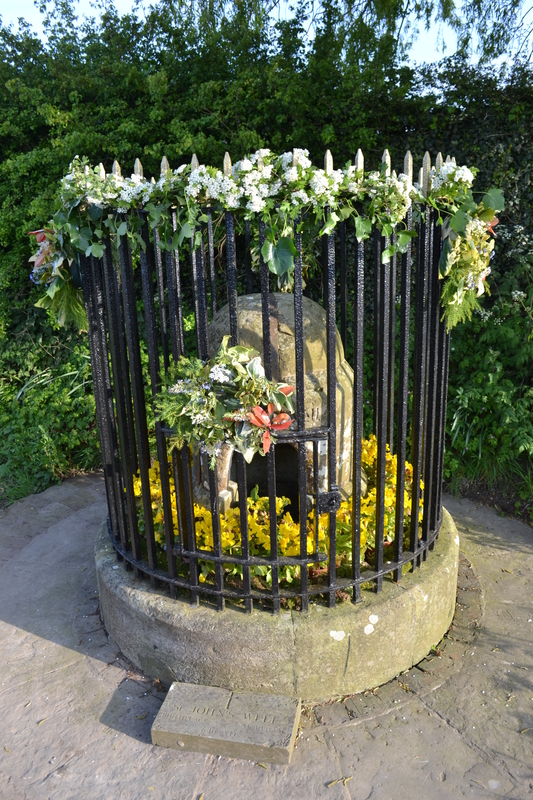 In other years ivy and adorned with a cross and garlands of tulips and daffodils had been used but the year I went the simple adornment was most effective in the evening sunshine. Similarly in previous years had meant only a slight representation of primroses making the well dressing a little lacking in impact. The year I went it was a glorious attempt. Primroses were still a little short in number in May and so much of the yellow was provided by mimulus. Inside the church people were gathering excitedly. Dark clouds had threatened all day but as soon as the choir appeared from the church the sun started to shine. 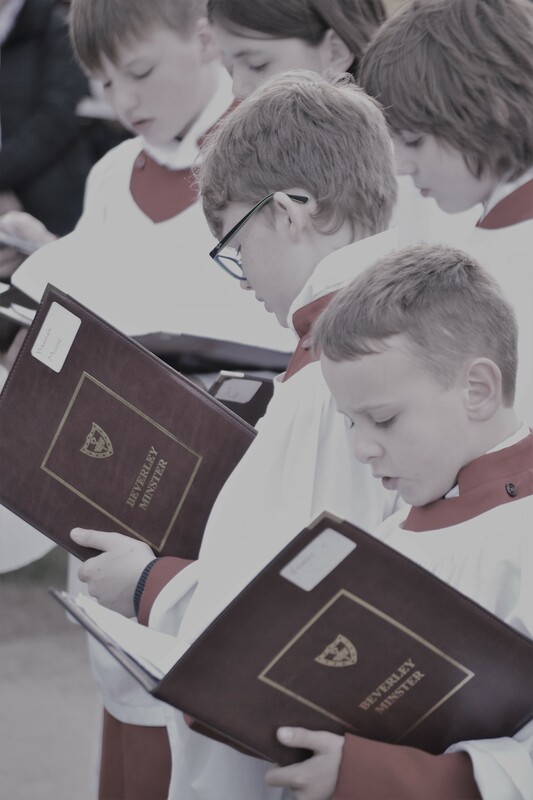 This choir which come from Beverley Minster, consisted of 27 men and boys of all ages enthusiastically were gathered beneath the church tower. They were running hither and thither; it looked like getting them to be in an orderly row would be difficult – but the choir master called out and they arranged themselves ready to go. The crucifer appeared and clutching their hymnals they were off through the churchyard down the lane to the church and then across the main road. Unlike similar processions there were no police in their bright jackets obscuring the spectacle. No cars appeared in the time they processed, it is an obscure village after all or was it the miracle of John taming the bullish motorcar. Behind the choir were the rest of the congregation which was added to as the procession went as curious onlookers, photographers and locals who had not managed to get to the church joined in. 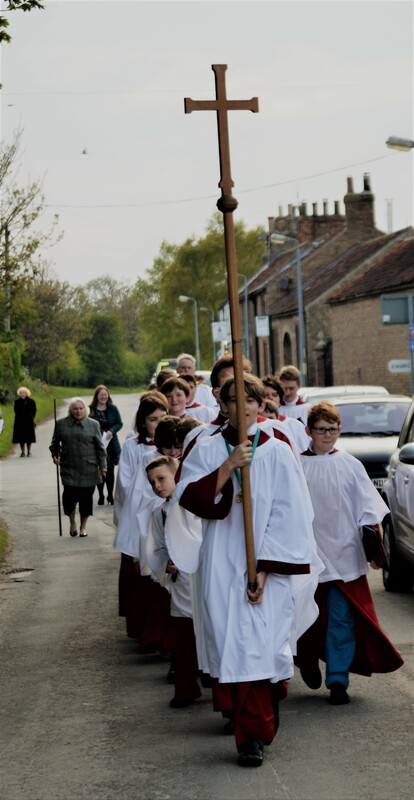 In such a small village such a procession was quite a spectacle: with its crucifer holding their cross up high and proud, snaking down the lanes to the well, with the white tunics of the choir shining in the evening sunshine. “In days of old in country ways, In Yorkshire woods, John sang they praise. Each year on the springtime wold, he saw the primroses unfold, the bleating lambs, the breaking sea. God gift to man eternally. 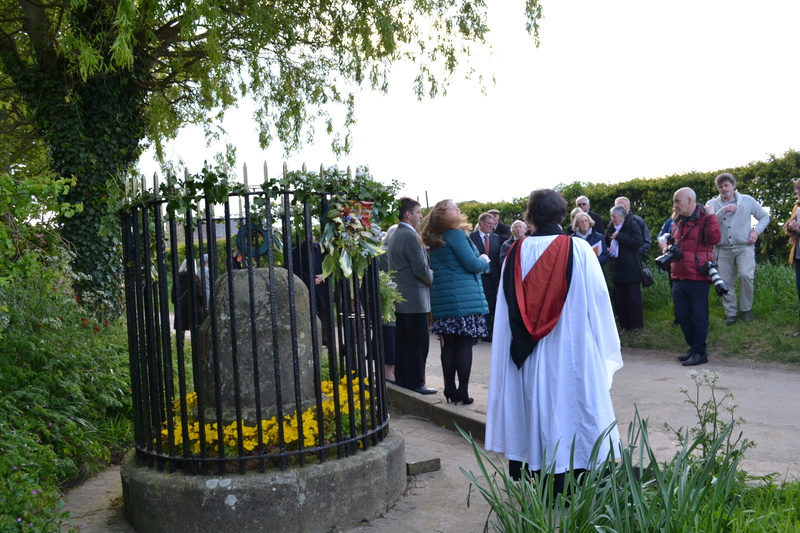 It was a short but evocative ceremony remembering this local Anglo-Saxon saint and the gift he gave to the village…once they had done their service they turned around and processed back to the church were a sung eucharist uplifted the spirits more. A delightful event which is nearing is 100 years and long may it be celebrated.